Going Tankless Part Three: Fox Plumbing & Heating Answers The Question: Are Tankless Water Heaters Worth It? Your water heater starts to leak and you call Fox Plumbing & Heating to send a plumber right away. The tank is ten years old and has rusted. It’s finished, kaput! Next thing you know you are faced with a decision. “What will I replace it with, another tank or should I go tankless?” Fox has the answers to these questions for you. Our three part series has focused on the features of tankless water heaters and how they work. Now for the ultimate question – is it worth it? What Is Important To You In A Water Heater? Even if the costs were the same for a tank or tankless water heater, there will always be reasons that people choose one or the other. Some Fox customers tell us that they feel more comfortable knowing there is a big tank full of water in their house in case the zombie apocalypse or the big earthquake hits. Others are afraid that when they go on vacation their tank water heater will flood the house, so they want to go tankless. Our plumbing professionals are happy to install the water heater that best meets your personal needs and wants. #1 Reason Fox Customers Choose Tankless Water Heaters? Topping the list of reasons to go tankless is your lifestyle. Tankless water heaters provide endless hot water. That means the activities of the house can flow, without suffering through cold showers or waiting around for a tank to refill. Everyone can shower and get out of the house faster. The spa tub can be filled to the top. And the washing machine won’t use all the hot water, leaving you waiting for more. Going tankless is one modification you can make to your home that can truly make you and your family more comfortable. What Does A Tankless Water Heater Cost? A typical tankless water heater will last for twenty years with minimal maintenance. For most homeowners, that tankless will be the only water heater you’ll ever need to buy for your home. In those twenty years, you would have likely purchased two standard tank water heaters. If you think of the decision in those terms, a tankless water heater will cost a little more than the multiple tank water heaters you’d buy in that timeframe. As we’ll discuss below, depending on water usage, the energy savings from a tankless might cover the difference. 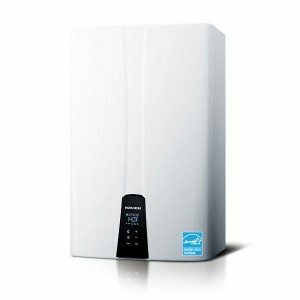 Why aren’t we giving an exact price for an installed tankless water heater? Because model features, sizing, installation complexity, and venting can vary the price by quite a bit. This is not a quick and easy one-size-fits-all installation like an electric tank water heater, and may take the better part of a day to do. Our Fox Plumbering Professionals are more than happy to provide you with a free estimate to compare a traditional tank vs. a tankless installation in your home. Will the Energy Savings Pay For the Difference? Tankless water heaters, especially condensing ones, are higher efficiency than any gas or propane tank water heater. Fox recommends Navien tankless water heaters that have energy efficiency ratings of .97-.99 EF, (.99EF means 99% efficient). That means 99% of the fuel used is turned into heated water. These super efficient products are EnergyStar rated and qualify for the federal tax credit for energy efficiency. According to Consumer Reports, the cost to heat water can represent 30% of a home’s energy use, and a tankless water heater can save up to 22% of that water heating cost. For folks with lower water usage, the savings can be even higher as there is no water to keep heated while you are not using it. 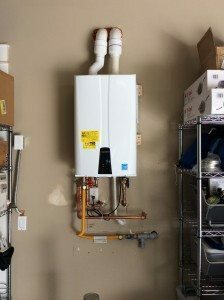 While the energy savings may not pay for the tankless water heater itself, it will likely cover the difference in the cost vs two natural gas tank water heaters over the twenty year life of the product. If you are ready to get a custom quote for your tankless water heater or learn more about the products that Fox’s expert plumbers recommend, contact us. Have More Questions About Tankless Water Heaters? Check out our other blogs in this series about tankless water heaters.